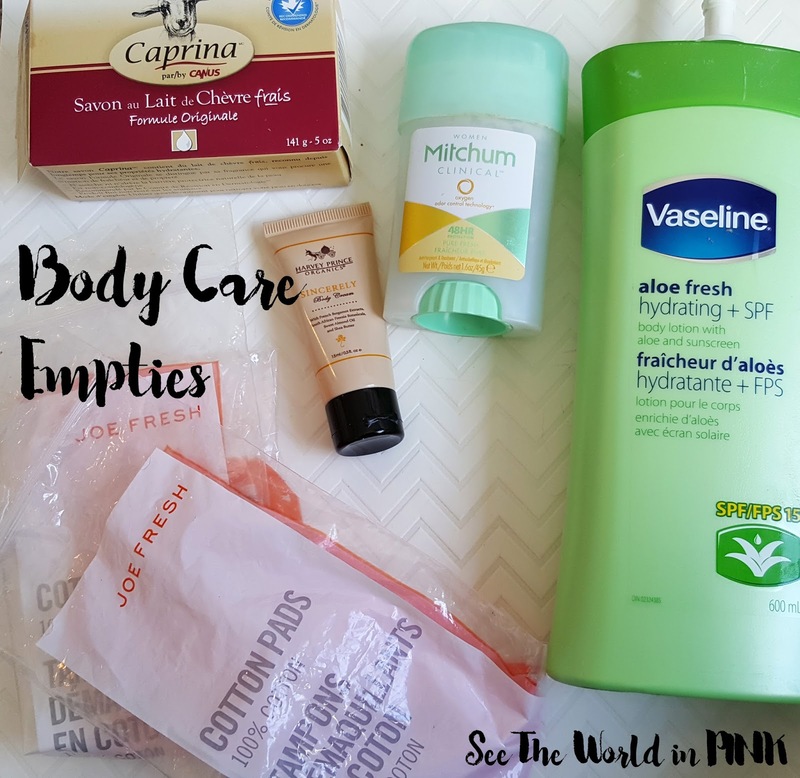 Here is a look at my Monthly Empties! I completed a full review on this product for a Mani Monday - you can view it here! This is a barrier for doing nail art. I really liked this product; but, when I went to use it this month - it dried up on me! I only got through about half the product and the rest came out in a big clump! Calgon Hawaiian Ginger Blooming Bath Petals ~ ??. Place four bath petals into warm water. Once dissolved, step in and relax. These are super old - they were in a Hawaiian Ginger set a long time ago. I love the Hawaiian Ginger set, but these petals never really dissolved. Urban Decay All Nighter Long-Lasting Makeup Setting Spray ~ sample size 0.5 oz for $4.50 (full size is 4 oz for $36). A weightless setting spray that keeps makeup looking just-applied for up to 16 hours. The Body Shop Fuji Green Tea Body Wash ~ sample size 60ml for $2.16 (full size is 250ml for $9.00). Cleanse and purify skin, while detoxing body and soul, with the crisp and refreshing scent of Fuji Green Tea™ Body Wash. This body wash smelled pretty good - I quite liked it! It was just basic body wash though, nothing amazing, just good. I got this in the Body Shop Advent Calendar. Lush The Comforter Shower Cream ~ 100 ml for $9.95. A cuddle in a bottle. This berrylicious, reassuring shower cream brings to mind warm, familiar memories. The blend of sweet cassis absolute, uplifting bergamot and assuring cypress essential oils create a blackcurrant aroma. Lather up and you'll feel like you're being wrapped in a warm hug. I absolutely love "the comforter" scent - it smells amazing! I also love the Lush shower creams - they are a thick shower wash and feel really great to use! I also used this one as some light bubble bath for the extra scent! Love! Purito Snail All in One Bb Cleanser ~ sample (full size is $16.00). Double effect of the first cleansing function and the second cleansing foam provide care and various nutrition for your skin. Controls PH and protects skin barriers to keep skin firm and resilient. With Snail extracts and Betaine, it gives brightening effect purify the skin that has become irritated by environmental factors. This was fine - worked well. This was actually a little sample - sometimes I can use these for 2 or 3 times to see how good, but not this one, I only got 1 use. It worked fine, but nothing I could say was really amazing. Eslor Comforting Mask ~ sample ($38.00 for full size). Helps eliminate impurities that dull the complexion for a deep skin cleanse. Made from natural marine extracts full of minerals and vitamins known to soften the skin. It tones and detoxifies improving oxygenation and hydration. I received a whole Eslor introduction set quite a while ago in one of my subscription boxes and I can't believe I hadn't tried the mask yet - I just featured this on my Month in Masks post too! This mask was surprisingly a really cool bright green color! It went on really easily and worked well. It took a couple of rinses to get off, but I liked it! Thought it made my skin feel good and deep cleaned! I really like the patches from The Face Shop - they come in 2 different sizes in the pack and apply well to the face! They also work really well and overnight my spots have been very reduced - these made my Favorites in April too! The Face Shop Seaweed Moisture Pack ~ sample (full size is $15.00). This sleeping pack contains seaweed extract, providing vitality and moisture to tired and dry skin. I have a bigger sample of this that I am using - but I took this sample with me for a weekend away. So far, I am liking this night pack. It is light for a night moisturizer, but works well. Fresh Rose Hydrating Eye Gel Cream ~ sample (full size is $50.00). A luxurious gel-cream that provides continuous moisture while illuminating and soothing tired-looking eyes. I really love all of the Fresh products that I have tried - this was a good eye cream and I wish I had more to sample! I did like what I tried! 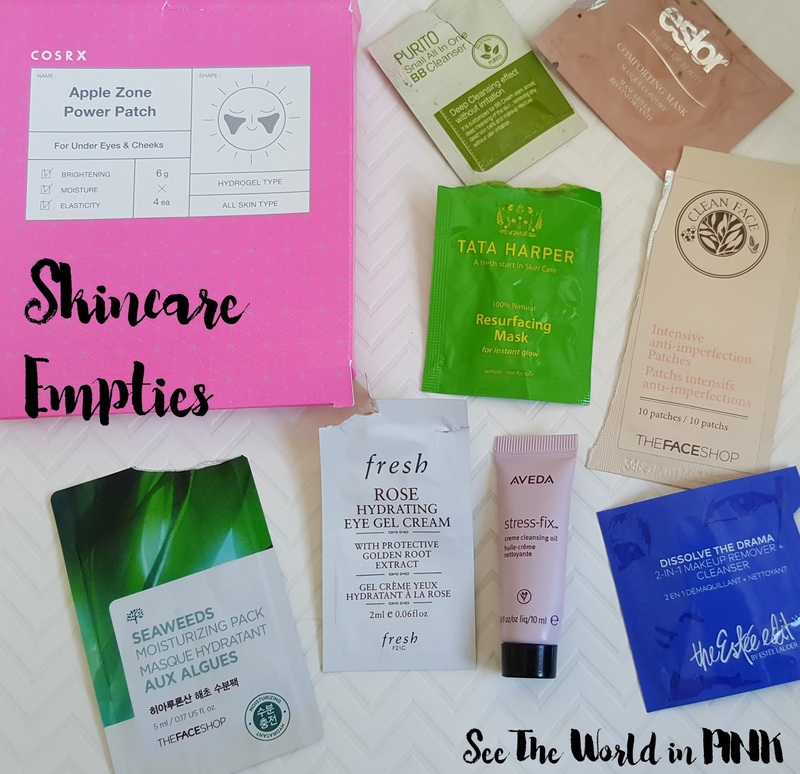 Repurchase: Perhaps - I would like to try more samples first! Aveda stress-fix™ creme cleansing oil ~ sample (full size is $28.00). Wash away your stress with this gentle cleanser enriched with nourishing certified organic sunflower and babassu oils. Aroma proven to reduce feelings of stress with certified organic lavender, lavandin and clary sage from the French Alps. This was a thick, creamy cleansing oil. I wasn't a huge fan of the formula - it didn't really feel likes a cleansing oil and it hurt my eyes when it got in them. Not my favorite and it didn't work as well as I wanted. The Estée Edit by Estée Lauder Dissolve the Drama 2-in-1 Makeup Remover + Cleanser ~ sample (full size is $36.00). A multi-action makeup-removing oil cleanser formulated with aloe, cucumber, and super-smooth oils to dissolve and rinse off even the most stubborn long-wear and high-pigment makeup. I guess makeup remover isn't the easiest thing to use from a foil packet - but this also just burned my eyes. I have already used one of these samples and I new I didn't like this, but it was easy to take for a weekend away. Elizavecca - Milky Piggy Elastic Pore Cleansing Foam ~ $15.90. Charcoal powder and other natural ingredient thoroughly removes makeup and fine dust without stimulation. I received this cleanser quite a while ago from a Memebox - it is a pure black cleanser so it looked really weird! It smelled quite strong and you could feel your pores tighten when you used this. 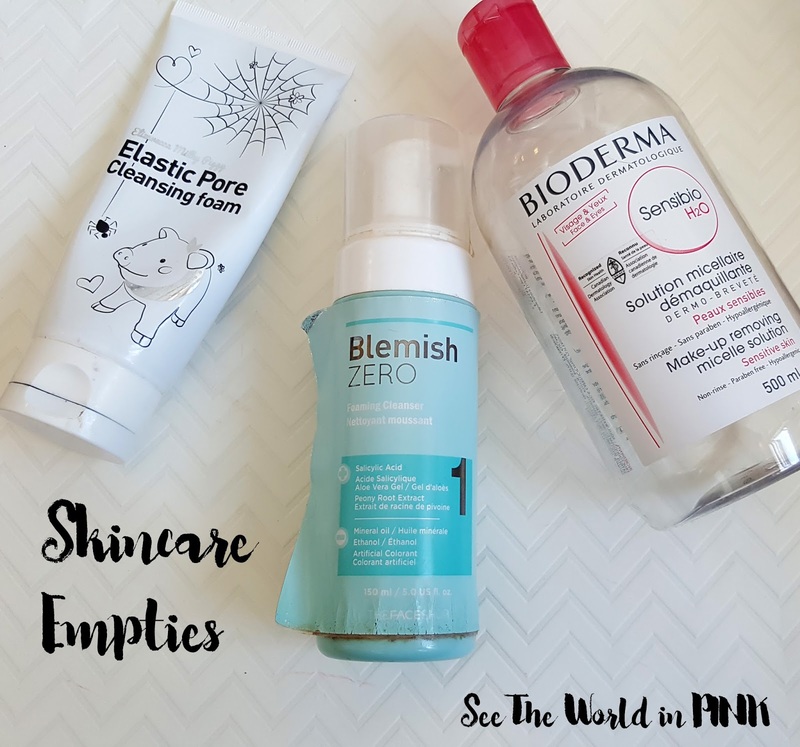 The Face Shop Blemish Zero Foaming Cleanser ~ $17. This light foam offers your skin an even and flawless looking complexion. Alcohol, mineral oil, silicone and artificial colorant free, its innovative formula reduces the appearance of imperfections while purifying skin. I thought I would try a different foaming cleanser targeting acne - I didn't love this one. I found it more drying than I wanted it to be. I prefer The Body Shop Tea Tree Foaming Cleanser much more! Bioderma Sensibio H2O Makeup Removing Micelle Solution ~ on sale 500 ml for$21.49. A cleansing and make-up removing water that respects the fragility of sensitive skin. I bought the big size of this Bioderma because it was on sale for a great price! This is my HOLY GRAIL makeup remover! I have completed a full review on this before - you can check it out here! This also made my Monthly Favorites last August because it is the best! Herbal Essences Naked Moisture Shampoo ~ $3.98. Want moisture as lush as it is light? Let the cool herbal mint scent refresh your senses as the shampoo cleans away unwanted residue. I got this in a past BzzAgent kit - I did like it at the start, but I really found using it more and more that it didn't really do much. My hair was always super greasy later in the day or the next day. Blah couldn't stand it! Herbal Essences Naked Moisture Conditioner ~ $3.98. Soak in the soothing herbal mint scent while this lightweight mint conditioner replenishes moisture from root to tip. This was a light conditioner - it worked well. I did like it better than the shampoo, but not enough to use it again. It did smell really good though! Verb Hydrating Shampoo ~ sample (full size is $8 - $36). 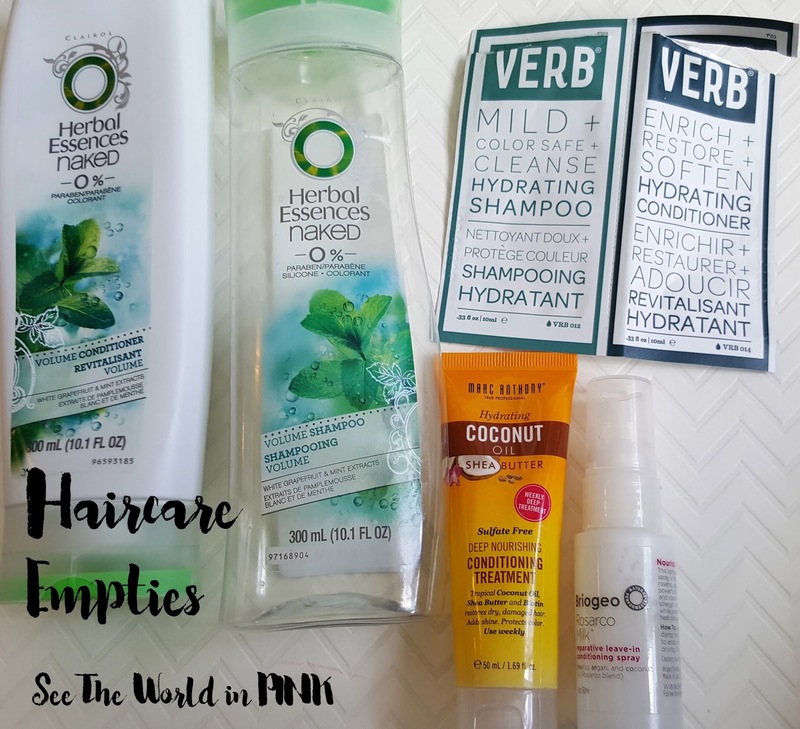 Verb Hydrating Shampoo is a mild, everyday formula that gently yet effectively cleanses hair. Great for all hair types including color-treated hair, it leaves hair feeling soft, smooth, and tangle-free. This was just a foil sample, but I actually really enjoyed this shampoo - I thought it was really good! Was hydrating and smoothing and great for my hair type! Repurchase: Yes, I would like to! Verb Hydrating Conditioner ~ sample (full size is $8 - $36). Give hair the color-safe hydration it needs with this everyday Verb Hydrating Conditioner. Formulated to wash away clean, it delivers intense moisture and natural shine to hair. Again, this was a foil sample but I really love how well this worked for my hair! I really like this! Repurchase: Yes, I think I'm going to try this again! Marc Anthony True Professional Hydrating Coconut Oil & Shea Butter Deep Nourishing Conditioning Treatment ~ sample size 50ml for $2.99. Indulge with this extra hydrating deep nourishing weekly conditioning treatment. Wrap each hair strand in a veil of rich hydration, protecting hair from moisture loss and correcting the look and feel of dry, damaged, dull hair. Coconut Oil, Grape Seed Oil and Shea Butter offer three levels of rich hydration while Biotin promotes body and shine. Hair is left soft, detangled, strong and frizz free. I don't but myself deep conditioning treatment, but I tend to receive them in my subscription boxes. I do have dry hair so I do like to use these! This one worked well - nothing outstanding to me, but good. I got this in a past Ipsy bag and I originally thought that I wasn't going to like this, but it turns out that I loved it! This made my hair so soft and amazing! I have tried a few other hair milks, but this is probably my fav! Caprina Fresh Goat's Milk Soap Original Formula ~ $2.49. Caprina soap contains fresh goat’s milk, a natural and highly effective skin moisturizer. Original is our signature Caprina formula. The first of all our formulas, it continues to be a favorite amongst our customers. All the beneficial properties of fresh goat’s milk are combined with subtle essentials oils derived from natural ingredients. You’ll love the clean fragrance! I really liked the soap formula - it was good. This scent was a little strong for me, but I liked it. Harvey Prince Sincerely Body Creme - Sample Size ~ $3.00. Revitalize, soften and soothe your skin’s dry, rough patches with our hydrating Sincerely Body Cream. An intensely moisturizing and deeply nourishing blend of Shea butter and sweet almond oil, combined with extracts of French bergamot and South African freesia, Sincerely Body Cream brings out your body’s natural luster, giving you silky smooth skin all day long. Infused with Harvey Prince Sincerely perfume. I didn't like this scent - it was was way too strong (honestly, like I find all Harvey Prince items). Joe Fresh Cotton Pads x2 ~ $2.00. Bath Time Box The Ultimate 15 Minute Bath Bomb "Flower Frenzy" ~ $7.50. Truly the ultimate bath bomb! Skin loving oils, water softening powders, and a special, natural foam booster gives these bombs a special twist. This bath bomb is HUGE! It smelled amazing and lasted so long! 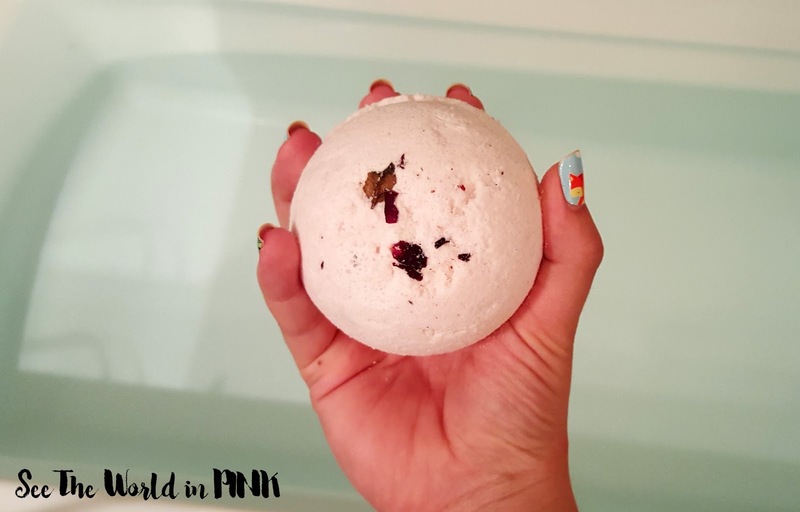 I love Bath Time Box bombs - they are great! This one is good if you are looking for a gentle relaxing rose lap! Lush Which Came First? Bath Bomb ~ $8.95. If this sweet and citrusy bath bomb can't answer the age-old question then what can? Crack open the generously-sized pink egg to coax out the surprise inside and enjoy three egg-cellent soaks over a couple of nights. Or, if you fancy something really decadent, use the entire bomb at once to infuse your bathwater with deliciously sweet, fuchsia waters brimming over with fruity fragrance. Why did the chicken cross the road? To get to the bathtub, of course! 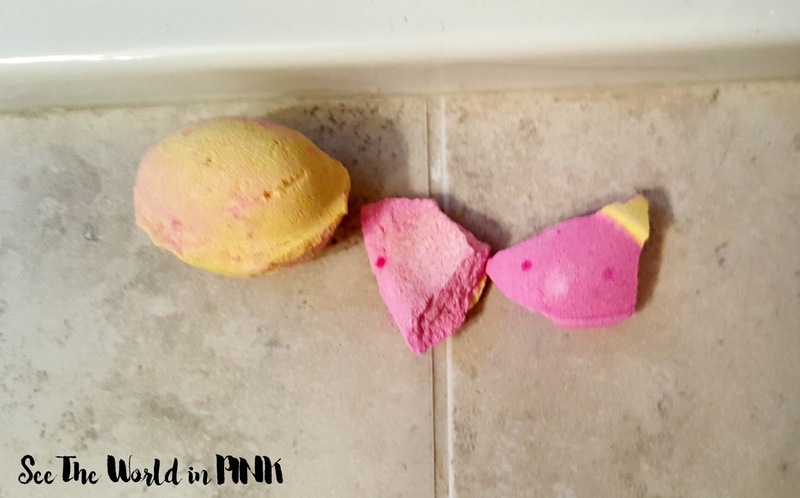 This is a piece of the Easter Bath Bombs that crack open to 3 parts - you can see the full post here if you want to see what they look like whole! This is a great smelling bath bomb, but the pink and yellow colors did not mix well in the bath! 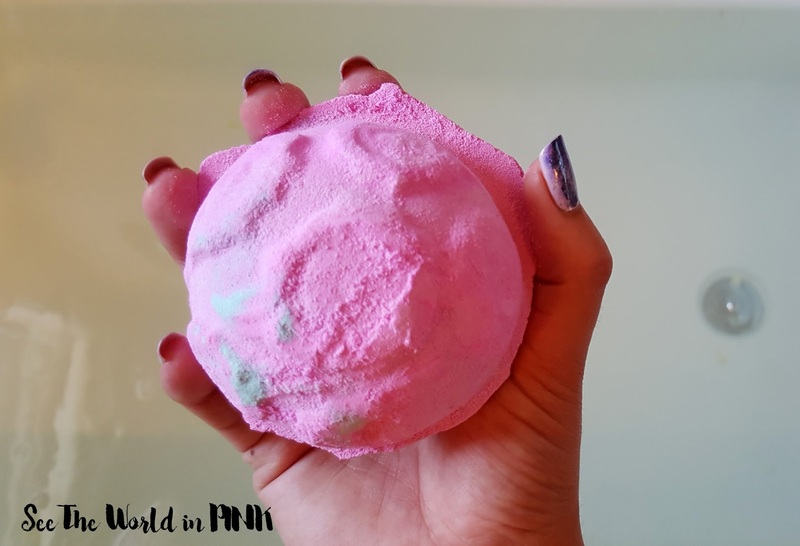 Lush Rose Bombshell Bath Bomb ~ ??. Special Edition Mother's Day Bath Bomb! This was cute, I got this in a Mother's Day set! This smells like roses and I loved it! It smelled amazing! This was really fizzy and made my bath bright pink! This month, I used up 32 products! 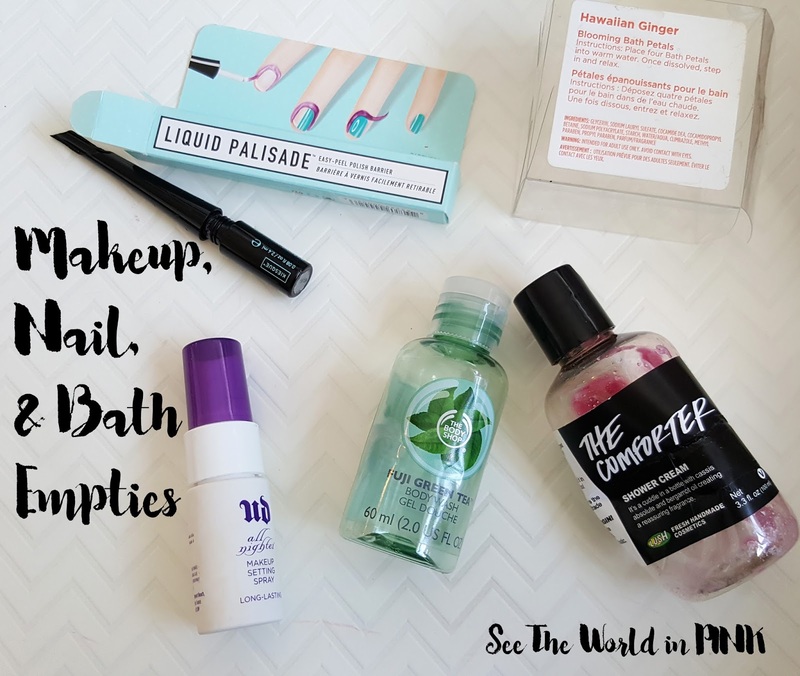 The last few months I have been going through a ton of products - lots that are great, and some not so much! This month was really skincare heavy and less makeup, but we were away for a couple of weekends so I brought lots of samples with me!